Being environmentally conscious has never been more at the forefront of homeowners' minds. One area where many homeowners are especially concerned is in the home landscape. More people want to create yards that are not only beautiful and comfortable, but environmentally friendly as well. 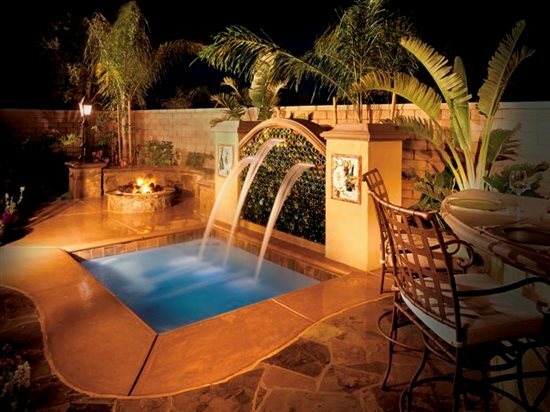 There are many ways to weave environmentally friendly elements into your backyard. Here are a few strategies for being kind to the environment and still enjoying an inviting outdoor space. Strategic PlantingPlan for the right plantings in the right places in your backyard. Select and place trees to provide a low energy, comfortable environment shading both the indoors and out. Deciduous trees on the west or south side of your home will help control both summer and winter energy costs. In the summer, your home will be shaded from the heat of the sun. And in the winter, the trees will lose their leaves letting the warmth of the sunshine fill your home. For your patio cover, consider installing a vine-covered pergola instead of a solid roof. The pergola is another low energy way to keep cool, and this 'living roof' provides shade much more effectively. Plants can actually help cool their surroundings through a process known as transpiration. The plants will release water through their leaves during hot weather, keeping people nearby cool and fresh. Some good deciduous, flowering vines are wisteria. A wisteria-covered roof will adapt to the seasons and will add fragrance to your outdoor area. Incorporate Recycled MaterialsFind new uses for materials that would otherwise be hauled away. Gardens provide a wonderful opportunity for creating artistic elements from recycled materials. 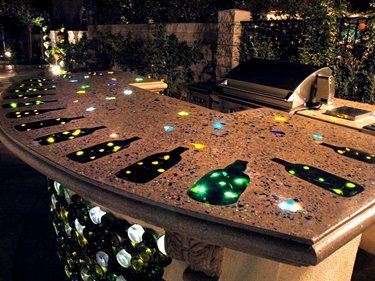 For example, you can use recycled glass in your designs. 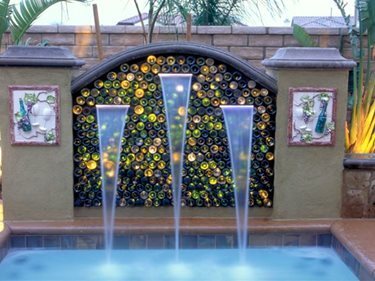 Scott Cohen, owner of Green Scene Landscape, uses recycled wine bottles to build colorful waterfalls, walls, and counters. You can also use broken glass to create mosaics. Recycling can be incorporated into just about every aspect of landscape installation. For example, if you have an old concrete patio, driveway, or walk removed, don't bring it to a landfill. Many companies process reclaimed concrete into a substitute for crushed stone, which has a number of valuable uses in the landscape. Also, look into using recycled mulch made from shredded urban forest products for your planting beds, trails, and playground areas. Practice Water-Wise LandscapingStudies continue to show that most landscapes are vastly over-watered. Do your part by incorporating a water conscious design. One of the best ways to do this is to group plantings with similar water requirements. For example, if you put the lawn on one zone, thirsty plants on another zone, and drought tolerant plants on a different zone, you can water each at different rates. If you don't, you'll usually end up over-watering many plants while trying to meet the needs of a thirsty few. Be choosy in the type of irrigation system you install. Some controllers include highly efficient water saving features such as being programmed to communicate with local weather stations and automatically adjusting watering schedules based on the weather. Also, using low volume sprinklers on the lawn and drip systems in your beds will help in using less water. These products are designed to deliver smaller amounts of water at rates tailored to specific plant needs. Because they don't water faster than plants absorb it, they promote lush plant growth with minimal runoff.